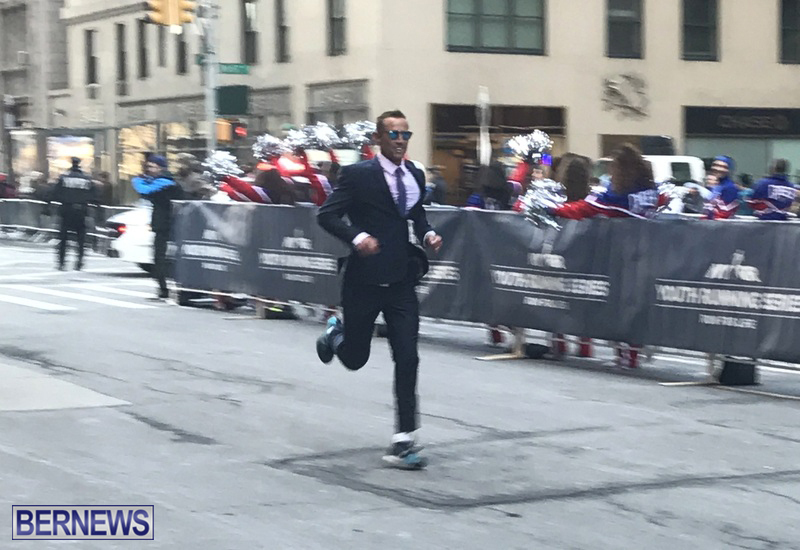 Bermuda is now home to the ‘fastest suit-wearing runner,’ as Chris Estwanik set a new unofficial world record when he finished the NYC Half Marathon today [March 19] in a time of 1:11:36, having raced the entire 13.1 mile distance wearing a suit – complete with jacket, shirt, and tie. His time of 1.11.36 saw him finish 55th overall out of a field of almost 20,000 runners, and appears to be an ‘unofficial new world record’, breaking the old suit running one by over 6 and a half minutes. He explained that it was restricted, but loose enough to allow him to run about 85-90 percent for the duration. Despite the less than comfortable running wear, he said it was “quite a fun experience,” and at the end of the race Meb Keflezeghi — a NYC Marathon Champion, Boston Marathon Champion and Olympic medalist – was waiting to congratulate him along with the race director. Having attained the ‘unofficial suit running’ world record, Mr Estwanik added that maybe next year he will run the race in Bermuda shorts. Once again well done !!! Well, nobody could say he was not suited for the task. Saw a guy in a suit running and thought of a couple politicians.